Whether you are a prospective college student on the verge of making your final acceptance decision or a high school senior deciding where to apply, consider taking a guided tour of your potential college campus first. A college tour is the perfect opportunity to ask the most pressing questions about your future college experience and to learn firsthand what it’s like to be in a collegiate environment. Asking the right questions during a campus visit might be challenging if you’re not sure where to start. Yes, you might want to know where the library is since you’ll be spending many long nights there, but also consider asking questions about your future life as a student. Where do new students live? Will you need to bring a bike to campus? Make the most of your college tour by posing these questions to your tour guides—usually students themselves—and learn from their wealth of knowledge and experiences. To help you decide which campus is worthy of your tuition dollars, NerdScholar asked college admissions officers to shed light on which questions prospective students should ask both before and during a campus visit. Ultimately, a campus tour—one that engages you and piques your interests—will give you a better sense of whether the college is the right fit for you. 1. When is the best time to attend a campus tour? Attending a campus tour any time of year is helpful, but prospective students should consider scheduling one when it will give them the most insight into their biggest questions. For example, students who have not yet applied can take a tour during the summer before they apply for colleges, while others may find it helpful to attend one after they’ve been accepted. 2. Does the school offer your intended major? 3. Can you schedule information sessions or interviews with admissions officers in addition to a campus tour? Some colleges offer prospective students additional opportunities to interact with students and staff aside from the campus tour. According to Julie Kerich, the director of admissions at Franklin & Marshall College, “many colleges offer information sessions, interviews, lunch with a student or the opportunity to sit in on a class.” Taking advantage of these opportunities will give you a richer experience and understanding of campus life, Kerich says. Because many schools require appointments with college personnel or department representatives to be made in advance, Delaney advises students to schedule these activities prior to their arrival on campus. 4. What are the acceptance and admissions requirements for my program? Asking about the admissions process is extremely helpful for students who have not yet been accepted. Knowing the answers to these basic admission questions will help you determine your likelihood for acceptance, as well as what steps to take during the admissions process. Not asking these questions, Delaney says, can potentially keep students from attending the school of their dreams. 5. What support services are available for students? 6. Why did you (the tour guide) choose to attend this college? Lieutenant Colonel John Powell Jr., admissions director at The Citadel, the Military College of South Carolina, suggests asking your tour guide personal questions about their experiences as a current student. Doing so will help you relate your views to theirs and determine which criteria are most important to you in selecting a college. To get a more insightful conversation going, Powell advises students to be ready to talk about themselves, their accomplishments and their college goals. 7. What is student life like outside of academics? “A campus tour is a chance to have those ‘silly’ questions answered that you may not have asked an admissions counselor,” Savidge says. Think about what you would like to know about student life outside of academics at this campus. What do students do during the weekend? How do students get involved in community activities? Student tour guides will be more than happy to answer these questions and give you a taste of what a real college experience will be like. 8. What are the most interesting, helpful or unique classes you’ve taken? Come prepared to a campus tour with questions specific to your personality and interests and pose them to your student tour guide. “It’s less important during a tour to ask, ‘how good is your math department,’ than it is to ask and find out more about some of the interesting classes and research opportunities [in the department],” Kerich says. When asking questions about specific departments and courses, Kerich says to keep in mind that your academic passions may change and evolve throughout your student career. Asking broader questions about academic opportunities will prove to be much more helpful as you start your first year. Don Delaney is the director of program outreach and educational services at Camden County College in Blackwood, Camden and Cherry Hill, New Jersey. He oversees recruitment, campus tours and community outreach for CCC. Julie Kerich serves as the director of admissions at Franklin & Marshall College, where she started in 2005 after working in various fields outside of education. Lieutenant Colonel John Powell Jr. is the director of admissions at The Citadel, the Military College of South Carolina. He is a Citadel graduate, a retired Marine Corps officer, and has served as an admissions officer at The Citadel for 22 years. Kate Savidge serves as the enrollment events specialist for Central Penn College. Planning open houses and program-specific visit days, she sees firsthand the excitement and nerves that prospective students have during the college application process. 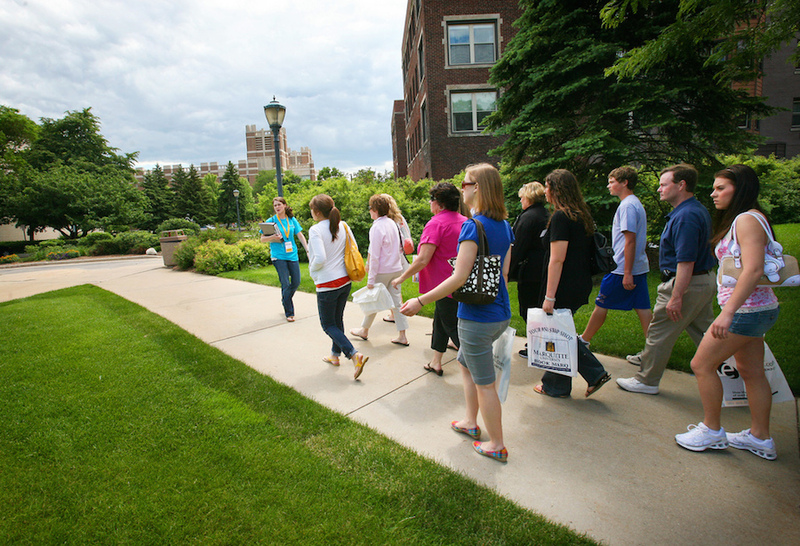 Image of College Tour courtesy of Flickr.